Why should we all be thinking about using Solar Power? One look at the picture of the Hubble should answer that question. It has been sending exciting pictures back to us since it left the Planet. 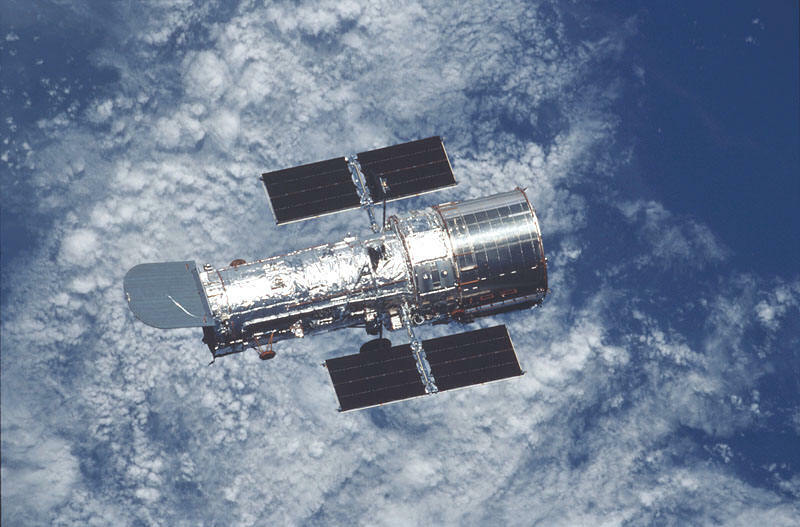 is thanks to Hubble's onboard Solar panels. natural gas, propane gas and electricity? What can we do to change the way that we use and buy Energy? What are nuclear power and coal power doing to our planet? or can be, but are they any cheaper than gas or electric? cost to make this phantom so called clean coal? and how does this affect the price of the food that we eat? in their dinosaurs for more fuel efficient vehicles. We are still thinking small, but we are thinking! O.K., I got that off my chest, now let's get started. since I first started installing them back in the early 70's. and the costs have come way down. to run its circulator pump! power outages or where you want to use this equipment. the pump will automatically shut off and uses water instead of anti-freeze. until the sun heats the panels up again. or baseboards and the sun can also heat your house. you can just install a coil into your system and you are all set! Tracks (land below the power lines) is being completely ignored. Hope you got a chance to see the story on HBO? most ambitious solar energy projects. and should put solar energy to good use. Solar can be installed on motor homes, cottages, campers and boats. roof of your caravan or motor home to charge your existing 12V battery. The kits can be adapted for use onboard boats also.